The West 6100+ is a 1/16th DIN panel mount PID temperature & process controller. It has a universal input and this model has an analogue output and relay output that can used as control outputs or alarms. Other models are also available within this range. 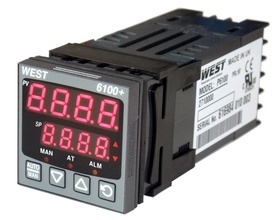 View more details of the West 6100+ - 1/16 DIN Temperature & Process Controller range. Other models might not be available from stock, please contact us for price and lead time.